Sunday afternoon’s performance against the Miami Heat is exactly what Larry Bird had in mind when crafting the current roster of the Indiana Pacers. He didn’t really care about how they played in the second half of the regular season. He didn’t care about how they played in the first two rounds of the playoffs. As long as they “survived and advanced,” that’s really all that mattered. Bird built this team with two primary goals in mind: attain the number one seed in the Eastern Conference and utilize this position to dethrone the big, bad Miami Heat. Of course, he would also like to add a ring to his already impressive collection, but after losing to the Heat in seven games last season and six games the season before, despite having leads in both series, Bird knew his Pacers must first get past Miami. Well, in Game 1 of the Eastern Conference Finals, the Pacers led from start to finish in front of a pleasantly raucous crowd at Bankers Life Fieldhouse in Indianapolis, Indiana. But was this really all that unexpected? If you have watched national TV such as ESPN or TNT to get your NBA fix, then yes, of course, Sunday’s performance was absolutely unexpected. Instead of looking at the big picture and how well this Pacers team is constructed for success against the Heat, in particular, major media outlets placed the most emphasis on all that was wrong with the team and how “unpredictable” they had been. Realistically, not even Pacers fans can really blame them, either. Team chemistry was supposedly disrupted after the trade of Danny Granger. This team had only 12 losses at the All-Star break, yet went a disappointing 10-13 to close out the regular season. Despite backing its way into the playoffs, this team somehow managed to retain the #1 seed over the two-time defending champs. This team needed a full seven games to oust the #8 Atlanta Hawks, who had a losing record in the regular season. At times, this team looked completely over-matched by the backcourt of the Washington Wizards in the second round. Yet, here they are–up one game to zero over LeBron James and the Heat with three home games left in this series (likely necessary). If you have watched this team on a regular basis over the course of the last three seasons like I have, then nope, Sunday’s performance was not unexpected–at all. This team, and its fan base for that matter, does not like the Heat one bit. For better or for worse, they always seem to play up to the Heat and play down to just about everyone else. Well, at this point, none of that matters. They are playing the Heat, and if they move on, one would assume they’ll be able to play up in the NBA Finals. Lance Stephenson, who has been the heart and soul of the team all season, really does not like Miami, and that altercation with Dwyane Wade is only a fraction of it. 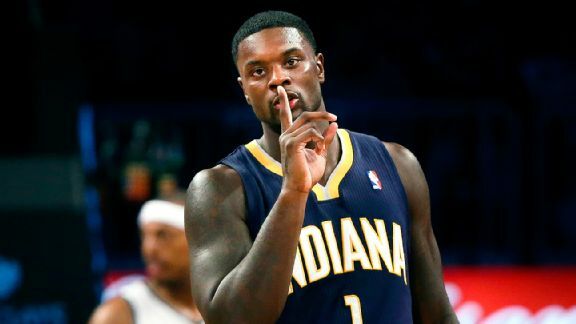 Unfortunately for the Heat, Stephenson is no longer just a bench player like he was two seasons ago, but rather an impact player that sets the tempo for the rest of the team. His Game 1 stat line (17 points, 8 assists, 4 rebounds), especially the assists, did just that–set the tempo for the offense, leading to all five starters scoring in double figures. Lance was born (ready) to the play the Heat, and when he’s on, the Heat really have no one who can guard him anymore–other than LeBron, one of the league’s best defenders of course, but his main duty is containing Paul George. Wade, with his banged-up knees, can’t do it. Chalmers can’t do it. Battier, at 35 years old, most definitely can’t do it. And then there’s David West. He has been on a mission all season long and has been willing to shoulder the load throughout an up-and-down playoffs. Now, he faces the Heat who, in short, cannot guard him–largely because they just don’t have a player that can match up with him both down low and on the perimeter/at the elbow. Again, LeBron has proven in the past he can do a good job against West, but unfortunately for the Heat, he cannot guard three players at once. Thus, the Pacers already have two big match-up problems to exploit before I even discussed their two max-contract guys–George and Roy Hibbert. George is obviously the team’s best player and is on the cusp of NBA stardom, but don’t expect much more than 20-25 points per game, as long as Spoelstra has LeBron guarding him. In terms of Hibbert, well, the Heat don’t really have a center. They signed Greg Oden for this exact reason, but the health of his knees still hasn’t exactly panned out. Hibbert almost disappeared in the Hawks’ series (not unexpected given poor match-ups), but he appears to be pretty much back, and one can expect performances similar to that in Game 1 for the rest of the series. Finally, George Hill and C.J. Watson. With four capable players already discussed, whatever the team can get out of these two point guards will be a bonus in my mind. Both are capable of extending the floor past the three point line which frees up slashing lanes for Stephenson and George. Both are capable of doing a little bit of slashing of their own, and Hill did a terrific job at this in Game 1–getting to the free throw line six times and making all six. I tend to believe the Heat will put extra focus on containing West the rest of the series, so one of these two players may end up playing a very key role for the Pacers. The Pacers stunk in the second half of the season and in the first two rounds of the playoffs, but that is very much in the past. Larry Bird built this team to match up well with the Heat, and that is exactly what happened in Game 1 on Sunday. Unfortunately, I do not know how this series is going to play out, but I really do like the Pacers’ chances going forward. Tonight’s Game 2 is crucial, but not critical–for either team. Keep a close eye on how Miami is matching up against West tonight. If he’s locked up, it will likely free up space for Hibbert down low or for one of the two point guards on the perimeter.